You are here: Home / The Library / Healthy ageing / No.14 Is it possible to levitate? No.14 Is it possible to levitate? Is it possible to levitate? Here’s how. Frogs, like us, are made up of billions of atoms. Each of these atoms contains electrons that zoom round a central nucleus. When atoms are in a magnetic field, however, the electrons shift their orbits slightly and that creates a magnetic field inside the atom. So when a frog is put in a very strong magnetic field the atoms behave as little magnetic needles pointing in the direction opposite to the applied field. The magnetised frog is pushed up from a region of high magnetic field into one of lower field, and it levitates. There’s nothing special about frogs. All materials, especially water, are ‘diamagnetic’ to some extent. Frogs are a convenient example, however, because they have a high water content, which is a good diamagnetic material. Since humans, like frogs, are two thirds water it means that it is theoretically possible to levitate a human ‘diamagnetically’. 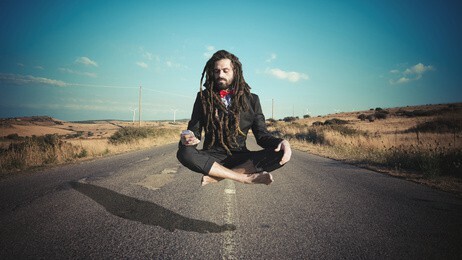 Street entertainers can also appear to levitate, but it’s not science – it’s a classic trick, called Balducci levitation. By standing at an angle so that their audience can see only one foot and the back heel of the other, the ‘magician’ can then stand on the tip toes of the hidden foot, lift the visible foot completely off the ground and pretend to be levitating. By the way, the electromagnetic force is billions of times stronger than the force of gravity. Prove this by holding a fridge magnet near a metal door and letting go. The electromagnetic force from the tiny magnet overwhelms the powerful gravitational attraction of the entire Earth. Want to know more? Here’s how those street artists do it! NEXT: Can you slow the rate at which you age?? https://www.nutrishield.com/wp-content/uploads/2015/04/logo-1.png 0 0 Colin Rose https://www.nutrishield.com/wp-content/uploads/2015/04/logo-1.png Colin Rose2017-03-08 14:17:142017-06-06 12:42:05No.14 Is it possible to levitate? No.9 How many sperm cells does the average man create in a minute? No.10 How many senses do you have? No.1 What percentage of your DNA do you share with a banana? No.15 Can you slow the rate at which you age? No.13 How often does your skeleton renew itself?